As a child Meccano was always one of those toys that I wanted to play with, but I never seemed to be allowed to do so. We had a small kit at home and I have vague memories of my Gran having some in her sideboard cupboard, but then I have no recollection of it ever coming out for us to play with. Instead we just seemed to always play Pick Up Sticks with her at her dining table whenever we visited. My Dad always used to speak fondly of building Meccano structures and machines when he was a lad and seeing as he went on to be a mechanical engineer I guess that makes sense. I also have fond memories of being taken around numerous model shows over the years with him and at many of those there would be giant Meccano machines that he would stand and admire whilst also trying to explain to my sister and me what they were doing and how they worked. Meccano has moved on a lot since then and whilst there are still fans who create giant builds from the old fashioned version of it (I saw some just last week at the St Albans Model Show with the kids) the modern version contains a lot more plastic than metal and children of today have the luxury of pre-formed shapes meaning that it is somewhat easier to create more complex models with it. 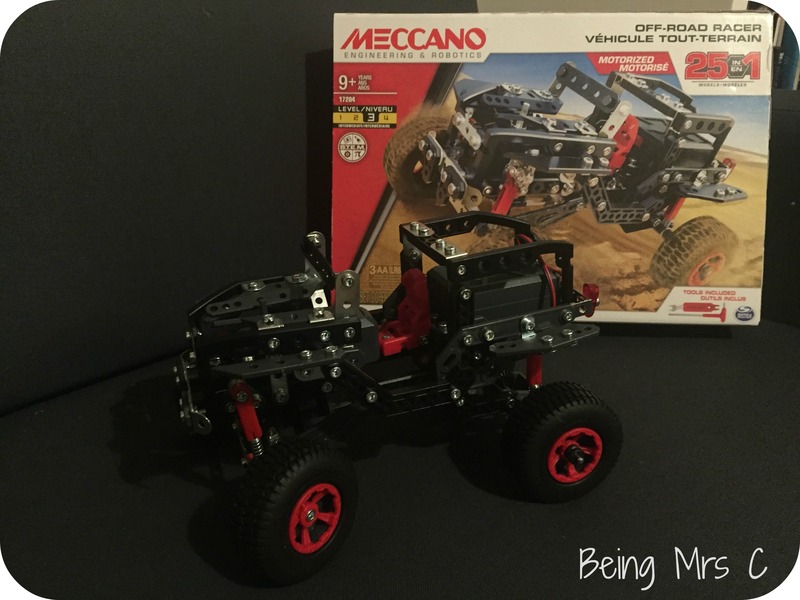 We were recently sent the Meccano Off Road Racer to review and despite this having a recommended age of 9+ on the box I was rather hoping that 7 year old Little Miss C might be able to take a stab at following the instructions and building it. She’s become a Lego expert builder over the years so I figured she should be able to follow the instructions, but it turns out I was possibly expecting a bit much from her there. Instead it was my OH B who took up the task sat at our dining table. He’s an engineer by day so I figured he would make small work of it, but I think it fair to say that the Off Road Racer is one of those kits that you shouldn’t expect to complete in a couple of hours, no matter how experienced an engineer you are. 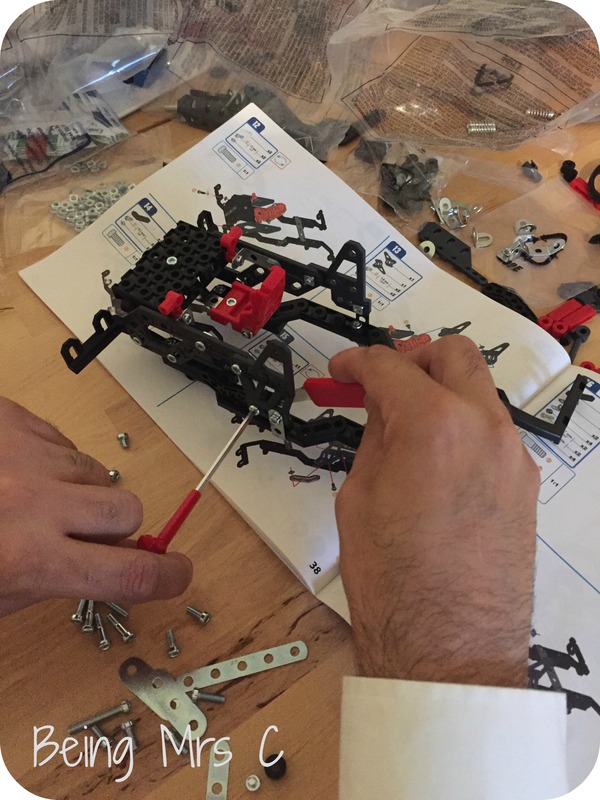 Packed with hundreds of pieces the Off Road Racer kit actually allows you to build 25 different models. This is boasted on the box, but once you open it up you actually find that the instruction book only contains plans for 3 of the models (including the one on the box that we built) but if you want the rest you have to go online. Although unhelpfully the instruction book doesn’t actually say where online they are. Even after finding them on the Meccano website there is no easy way to link to it (Pure genius! 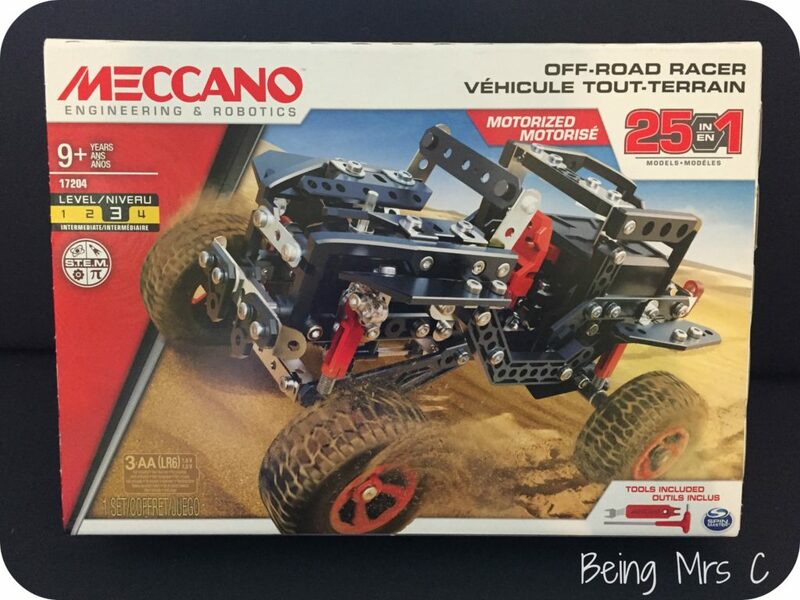 Thanks a lot Meccano) so what you need to do is go here and then do a keyword search for “off road racer” and you should get 25 variants of instructions come up. The instructions themselves are generally very clear, although you do need to make sure you have a clear head when following them so as not to make little mistakes that can go unspotted until further on in the build. 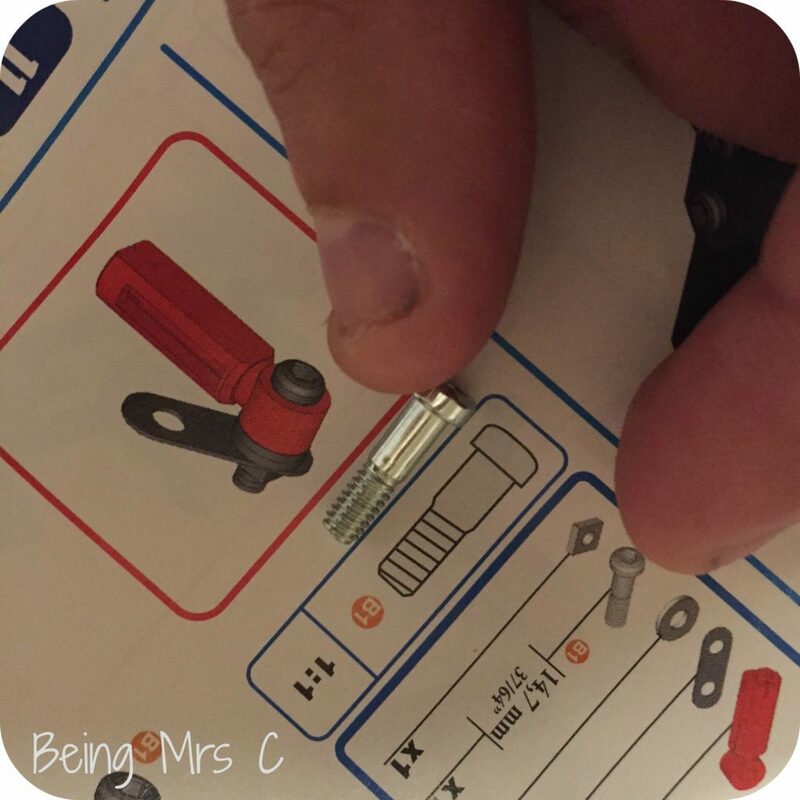 The set contains lots of different screw sizes, but one particularly helpful thing is that on each section of the build they give you a 1:1 image so you know which screw to use which is very handy as it saves you having to keep measuring them all the time. The tools that are supplied in the kit are very good and useful (meaning that you don’t require any other tools) especially the “nut holding tool” for holding nuts in the awkward places. Not all the 25 builds use the battery pack and in fact only one of the three in the printed instruction book included does. One top tip though is to make sure you put the batteries in first, before you do any construction, as you need to put it in place during construction and then you can’t open it up at the end to add the batteries. Bet you can’t guess how we discovered this? In turn, this means that once built, if the batteries run out you need to deconstruct it to change them. Not ideal, but I guess that gets you building something else with it. Having built the Off Road Racer I would definitely say that the recommended age of 9+ is right as it can be a tricky project in parts. It required a good level of dexterity as well as an ability to follow the instructions, which may actually work better with a younger brain over an older one! If you’re looking for an engineering project to keep a child busy over a weekend or several days then this is the gift for them. 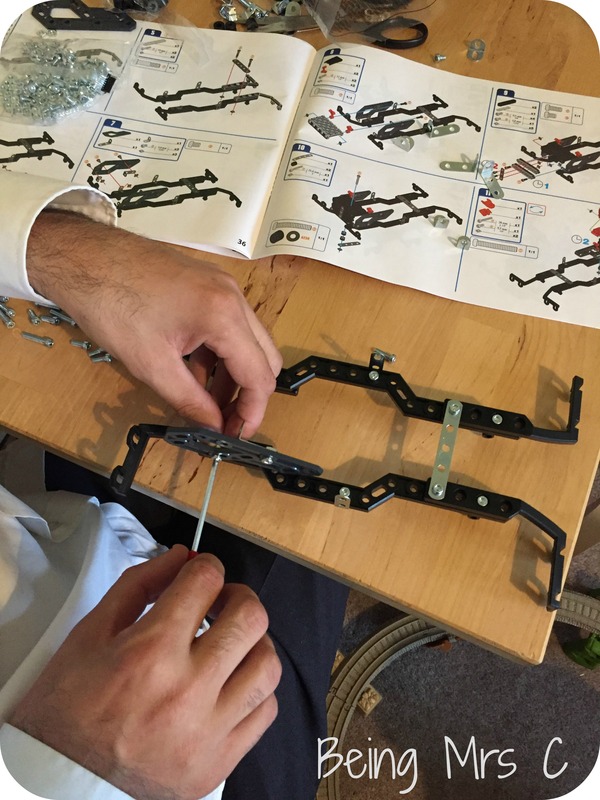 With the option to build so many models it also means that it can be dismantled and rebuilt again and again without repetition, making it something that children can keep gaining from without getting bored. From an adult point of view that also makes it great value for money too. 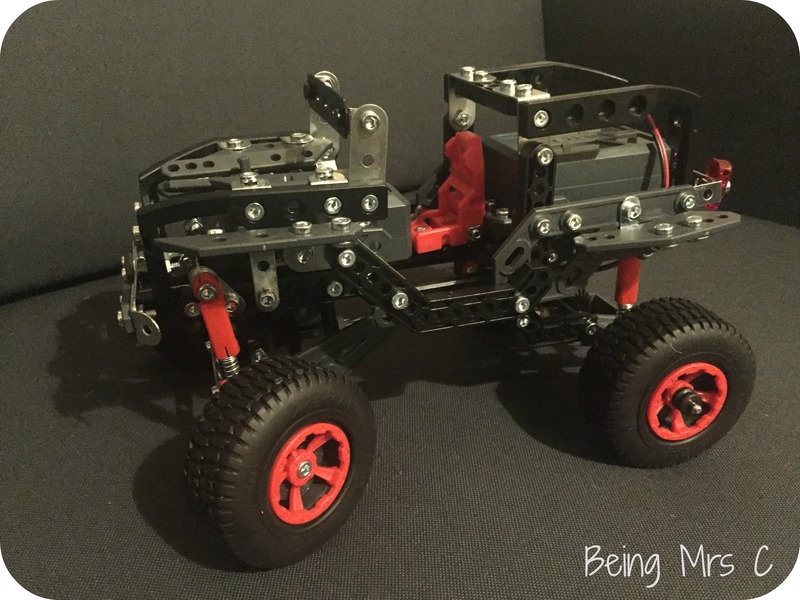 Disclaimer: We were sent the Meccano Off Road Racer kit for the purposes of this review. All opinions remain my own. This post contains affiliate links.